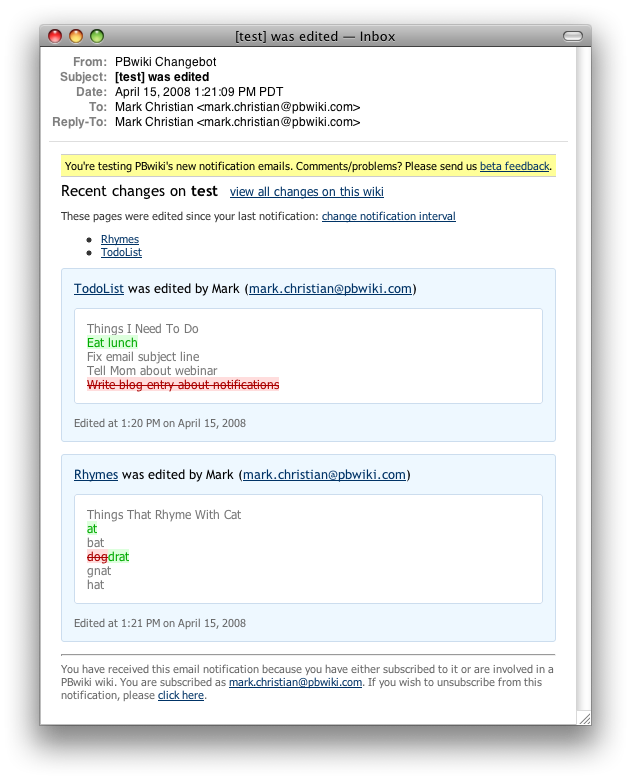 When PBwiki 2.0 launched, it included lots of great new features, but one thing stayed exactly the same: the notification emails you got when somebody changed a page on your wiki. We fixed that today — here is a sneak preview of the new version of notifications. Won’t be marked as spam! Keep in mind that they’re not quite done yet, so if you have any problems, just turn off the sneak preview (and be sure to send us feedback). Enjoy! Students in my class are getting notifications for all the updates that occur in the wiki. I should be the only one that gets these notifications. @ Virginia – right now, the least frequently we can send notifications is once per day, but we have many more improvements planned. Keep an eye out! @ Aegis – we’re still working out hte last few bugs for migrating wikis from 1.0 to 2.0, but we should have that soon. Thanks for your enthusiasm! Why do you torment us with these updates on features for PBWiki 2.0 when many of us are still stuck on 1.0 and yet to be invited to migrate? When will the migration happen? I like the new stuff. Going from 1.0 to 2.0 has created more than one difficulty… I am VERY sorry to have lost the Invite key function. As the admin of various educational wikis, I no longer have the ability to take groups of students to the site to work collaboratively. 2.0 requires that I have knowledge of all their personal email addresses in order to give them rights. This is very labour intensive and I don’t want to know that info. When will this be resolved? On the wiki teachwithtechumass (currently private), if I change to preview the new notifications, we receive no notifications at all. would love to be able to “Notify Others of Changes” regardless of their notification preferences. Most of our users have turned off notifications, but occasionally, there are cases where it would be beneficial to notify them of a page when the creator/editor feels it’s relevant.